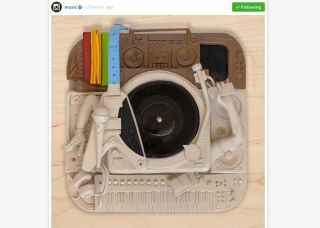 Instagram launches @music account to filter artist content | What Hi-Fi? Instagram has launched its first content channel and it's dedicated to music. The company says more than a quarter of its 300 million users are musicians. The Instagram music account will be "dedicated to exploring music around the globe, from those who create it to the community around it". The social media network began life focused on photos, with its orginal USP being the ability to add a variety of filters to your images, but has latterly added videos complete with sound. Various musicians and record labels have subsequently used Instagram to preview new tracks, reveal behind the scenes footage and generally connect artists with fans. Beyonce (31 million), Taylor Swift (28m) and Justin Bieber (26m) are three of the most popular people on the network, reaching millions of fans with every post. Kevin Systrom, the founder and CEO of Instagram, announced the new account in a blog post, promising it would shine a light on up-and-coming artists as well as encouraging "community participation with a new, music-themed monthly hashtag project". On Instagram? You can check out the WhatHiFiUK account for pictures from our test rooms, live shots from product launches and more.